Another year of AFI FEST is over, 83 features and 36 shorts screened across eight days. This year I highlighted 33 films as high priority, set out to see 25 and ended up seeing 17. In order to give a fair amount of coverage to all 17 films viewed, I've decided to break the festival down by day(s) including short reviews for each film. Below you'll find my coverage for the fourth day of AFI FEST 2013. 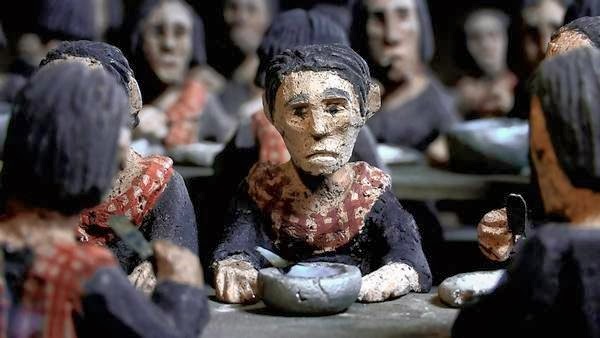 "The Missing Picture" is a powerful documentary that exhibits impressive craftsmanship while re-telling haunting experiences under the Khmer Rouge from 1975 to 1979 in Cambodia. It becomes clear while watching the documentary that this process was very important to director Rithy Panh. This is his way sharing the harrowing experiences with the world. It is his way of coping with the horrific events he endured under the terrorizing reign of the Khmer Rouge. This is also his way of letting go of the traumatic experience and passing it on to others. This documentary is terribly haunting and feels heavy handed at times, however the heavy-handed nature is validated by a topic people need to experience. As for the experience, "The Missing Picture" takes a unique approach using over 400 sculpted clay figures to recreate the appalling events that transpired. The clay figures are remarkable in both their detail and the emotions that carry through each of them. No actor would be able to carry over the level of emotion that rings through each of the hand-sculpted clay figures. It is a strange experience, but it feels as if the souls of these fallen Cambodians project through each of the clay figures. "The Missing Picture" also blends in images taken by members of the Khmer Rouge as well as a few family photos. These images take on different approaches, part of it is painstakingly illustrating the ideology and brainwashing that was being carried out. The other part of it was to visualize actual faces versus clay figures of real people, friends, and family who died or were murdered. These moments are some of the most somber within the documentary, moments that truly stay with the viewer after the fact. "The Missing Picture" is a film I would use in my own classroom. It is documentary I will herald and share with anyone I can. It houses plenty of shocking images that are hard to swallow but all images that deserve our continual attention. "Juvenile Offender" has meaningful intentions unfortunately they are lost in a web of never learning your lesson. Part of what director Yi-kwan Kang seemed to be doing in the family drama is hammer home the point of a repeat offender. That our repeated actions can only lead us down the same path. He hits themes like regret, acceptance and responsibility, yet leaves out the all-important growth. This film is focused on highlighting the negative in a more scared-straight approach versus giving the audience any seeds of growth. On the other hand, he is illustrating a legitimate portion of juvenile offenders who become habitual. Offenders who never break their cycle. There is a level of respect for what the director is presenting, it just never effectively embodies what it should. On the positive side, both Young Ju Seo as Ji-gu and Jung-hyun Lee as Ji-Gu's mother deliver fantastic performances. Both actors have difficult emotions to convey. On one side you have a young mother, who gave her child up at birth and knows nothing of how to handle a child let alone a teenager. On the other side you have a teen, who is filled with anger over being abandoned as a baby, and now he must find common ground with an irresponsible adult who is supposed to be his mother. The relationship works well on screen and comes across natural. Their relationship along with the theme of the film however, is entirely frustrating. As a parent who started young in life, I have a hard time feeling any type of remorse for the selfish actions of a twenty-something female who finds parenting hard. It is hard and it takes plenty of work, though director Yi-kwan Kang just wanted to focus on their inability to do the work necessary. This ultimately left me displeased with the film. While I see what the director intended, he spent far too much time wading in the same material for the point to have any lasting effect. Stay tuned for more breakdown of each day at AFI FEST 2013. Check out more coverage from Day One, Day Two, and Day Three.